It is only reasonable that users wish to protect their personal details from prying eyes. 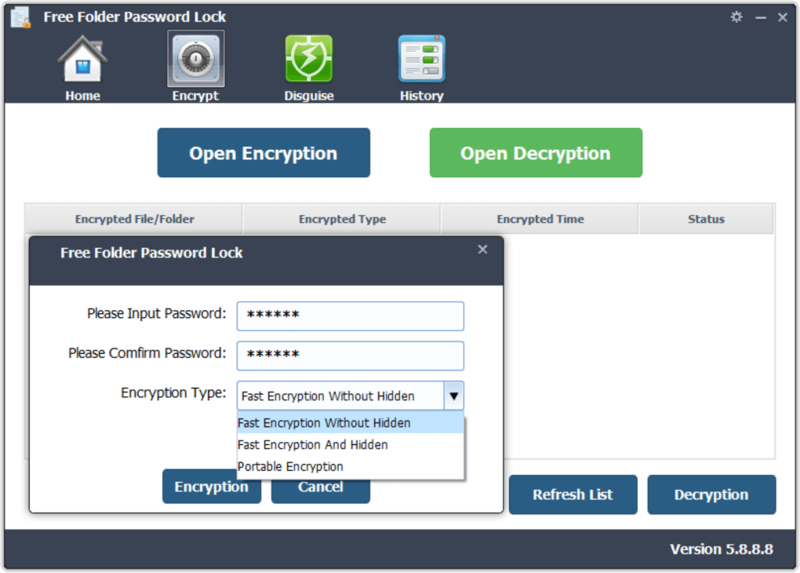 Free Folder Password Lock is a basic encryption tool which offers an additional level of protection and security. The standard version of this software is free. It offers a very intuitive interface. Some older operating systems may not be supported. Free Folder Password Lock offers three primary types of encryption. These are encryption without hiding the data, encryption alongside masking the information and the choice to work with portable devices such as a USB flash drive. Folders can likewise be disguised in order to deter others from viewing their contents. It is possible to label these areas with more mundane titles such as a printer application bundle or a recycle bin. As the title suggests, the basic version of this package is free to install. Free Folder Password lock is a perfect solution for those who might not have a great deal of technical experience. All options are clearly displayed and the encryption process can be activated with the click of a button. It is also possible to view other details such as the number of encrypted files as well as the previous actions taken by the user. A premium version which contains more advanced features is available. Lock, hide folders and files. Free Folder Password Lock is data encryption software which allows you to lock and hide folders and files including Text, Photos, Videos, Documents, Archive files, audio files to avoid modify, delete and rename. It provides you three encryption types: Fast Encryption Without Hidden, Fast Encryption and Hidden, Portable Encryption(You have to select this mode if you need to password protect files from portable devices like SD Memory Card, External Hard Drive, USB Flash Drive and Pen Drive.To protect your privacy, you can also disguise folder as Recycle, Printer, Network Dialing and Network Neighborhood. What do you think about Free Folder Password Lock? Do you recommend it? Why?